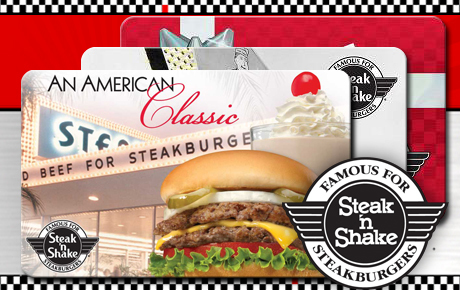 Hide deals from seller "Steak 'n Shake"
Hide deals from category "Diners"
$5 for $10 Steak 'n Shake Takhomacard©. Mailed to Chicagoland Addresses Only. Deal Dollars cannot be used toward purchase. Subscribers who purchased previous WhereYouShop/Deals Magazine Steak 'n Shake deal are ineligible. Duplicated accounts will not receive card. Steak 'n Shake is not responsible for lost, stolen, physically damaged or unauthorized use of cards, so please protect this card like cash. The card will not be replaced if the card is lost, stolen, or damaged. Shake up your day with the delicious tastes of your local Steak 'n Shake. Relish in a classic like their Real-Steak Steakburgers™ or select from any of their equally tasty menu options. This exclusive Deals Magazine deal, 50% off a Steak 'n Shake Takhomacard©, is the cherry on top of their already irresistible milkshakes. With purchase, you will also receive a FREE subscription to the print edition of Deals Magazine, mailed to you. Deals Magazine will never cost you a penny, but will save you millions of them! 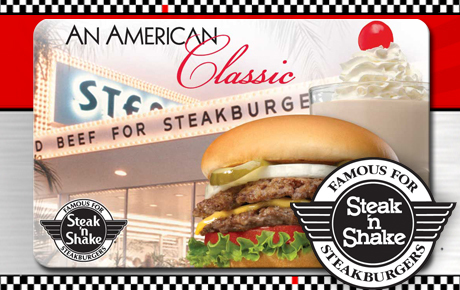 A Steak 'n Shake Takhomacard© can be used at any Steak ‘n Shake, anytime. The friendly wait staff at your local Steak 'n Shake is waiting for you to stop by for breakfast, lunch or dinner. Diner-style restaurant that serves that is home to the Original Steakburger. Allow 7-10 business days for delivery of Steak 'n Shake Takhomacard© to the Chicagoland shipping address indicated at checkout. Once received it can be used at any Steak 'n Shake location.